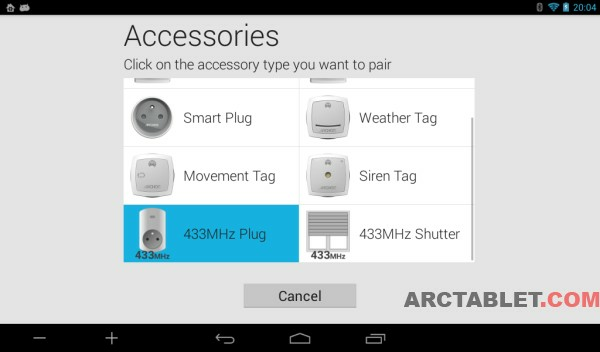 As we discovered a month ago, the ARCHOS Smart Home system offers support for devices in the RF 433 MHz band. 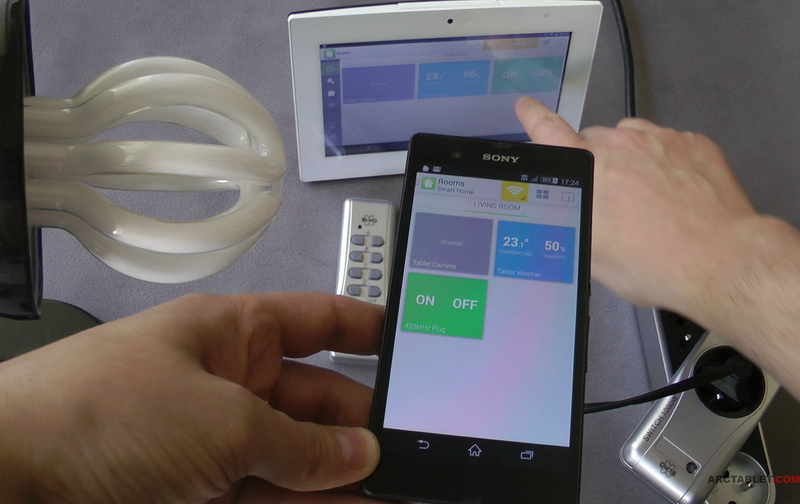 This feature is quite interesting as it should open home automation control to a wider range of devices with 433 MHz accessories such as power plugs, shutters, door bells and many others. Integration with wireless power plugs is a great solution for remote control from an Android or iOS device, the cost of RF 433 MHz plugs being rather low, usually in the 20 euros range. In addition, the solution should scale easily as you can connect and control different plugs at the same time provided they use a different codes. We will see in this article there may be some incompatibility issues with some accessories. This kind of wireless accessories usually come in 2 pieces: a remote control that emits the command to the end device such as ON/OFF position on a wireless switch, Open/Close position on shutters, etc... At the other end, the command is received by a module in charge of executing the order. The communication is established in one way, there is usually no feedback or other interaction back to the remote control, which does not have the possibility to retrieve the actual state of the plugs/shutters. 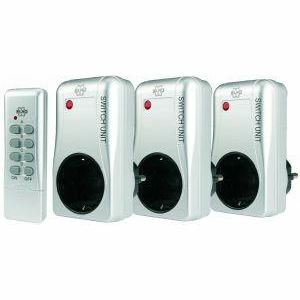 The security on the system is usually achieved by a code that helps to pair the remote and each device. This code is generally configured on both ends by DIP switches as you will see at the beginning of the video below. Most advanced and secure 433 MHz accessories use cryptographic systems that would prevent the ARCHOS Smart Home learning function to work. This is especially the case for some entrance gates, garage door openers or shutters as some of these devices have extra level of security provided by their manufacturer. 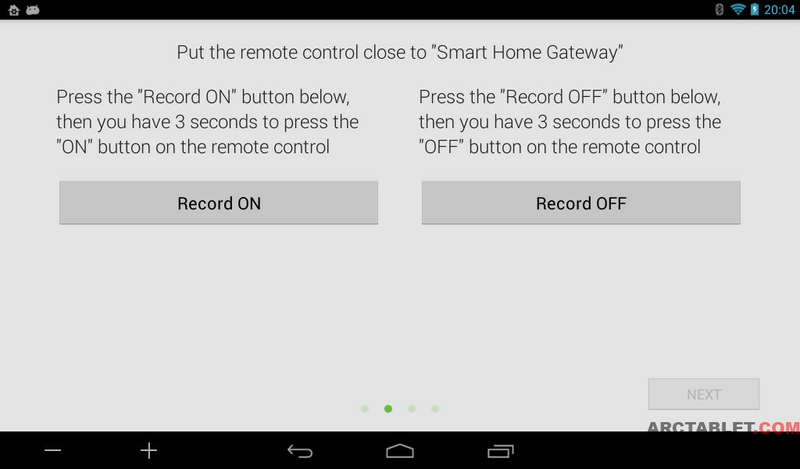 We used a Smart Home tablet from ARCHOS kit and one plug and the remote control from the Elro AB440S pack (see below). 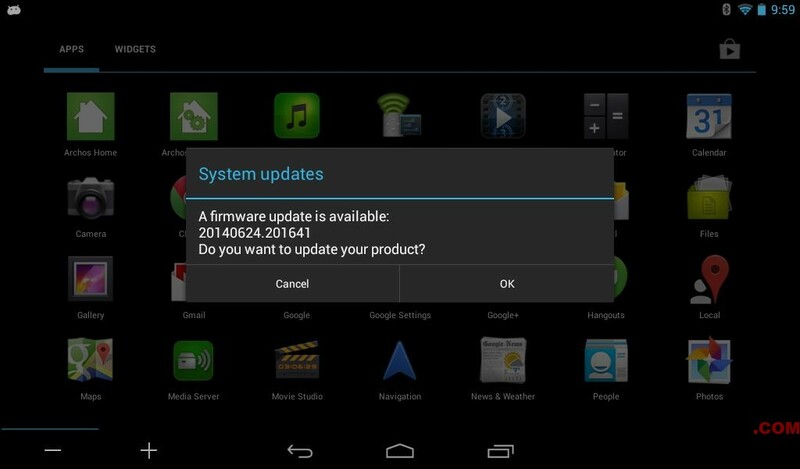 ARCHOS recently introduced 433 MHz support on the Smart Home in latest firmware and apps so you will need to make sure your device is up to date if you want to use RF. 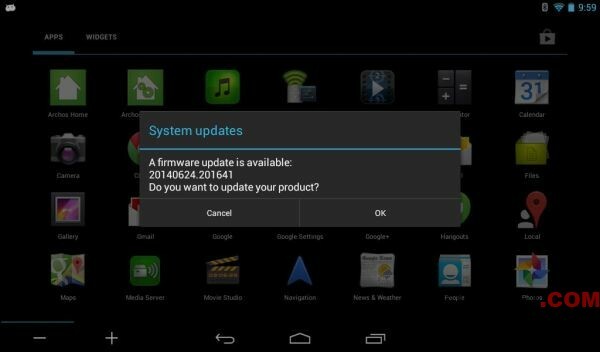 Firmware should be dated 20140624 (or later) and Smart Home application from 20140701 or later. 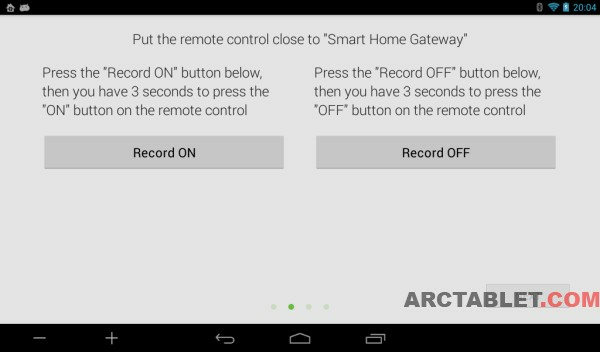 Learning procedure: it consists of two steps where you get the ARCHOS tablet to record the RF signals from your remote control. For each power plug, you can learn the ON and OFF positions. Once it has been learned, the tablet will be able to replay the 433 MHz signal for each position. Similarly, for shutters: the learning procedure will get you grab the Open and Close positions. Support for 433 MHz accessories on the Smart Home is currently limited by design to plugs and shutters. With this first test, we are starting a compatibility listing, if you know any compatible device please post in the comments section below, we will add it to our list. 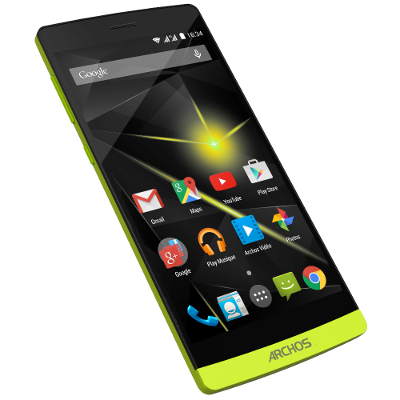 Please come back soon for more news and tips on the ARCHOS Smart Home ! Unfortunately the 433 support does not include 433 door contacts or 433 motion sensors. Also, I cant find the motion ball on sale, so for 433 actuators all well and good, but to sense motion...ooopppsss. I have just purchased an Archos Smart Home after 18 months using a Ninja Block and I am quite impressed by the Archos, but the above limitations mean I can not transistion over completely, as the Ninja Block is more flexible.